Universities across the country are failing to accurately label violence toward Black students as hate crimes. Chennel Jazzy Rowe, a Black woman, began college at University of Hartford this fall, experienced chronic health issues and was harassed by her roommate. After a month and a half Rowe was finally approved to change dorms. Rowe’s white roommate, Brianna Brochu, then revealed and bragged on social media that she had been poisoning Rowe with moldy substances and bodily fluids because of her race. Despite apparent evidence, the university has yet to acknowledge Brochu’s actions as a hate crime. Rowe’s case is one of hundreds of hate crimes toward Black students this year. Just in the fall 2017 semester, hate crimes targeting Black students occurred at American University, Cornell University, Cabrini University, University of Michigan and Framingham State University. Hate and bias incidents in general have increased since the presidential election in November 2016, according to the Southern Poverty Law Center, which reported 330 hate and bias incidents on 126 college campuses through March 31, 2017 alone. Hate acts range from flyers relieving white guilt to flying confederate flags, poisoning individuals and other forms of physical violence. The increase in these horrendous hate crimes toward Black students perpetuates the notion that these students do not belong in higher education. Black students are not represented equally in student populations at universities, and campaigns to increase diversity are useless without universities acknowledging and addressing racist violence. After the poisonings were reported by Rowe on Oct. 17, the university turned the crime over to West Hartford Police Department the next day. University of Hartford presumably expelled Brochu over two weeks later and claimed to have approached the situation with a standard protocol. During the process, the administration asked Rowe to not openly discuss the investigation, sweeping the narrative of the hate crime under the rug. Rowe revealed in a Facebook Live video that she felt silenced while the university failed to open discussion on hate crimes occurring on campus. She spoke out about the damage to the mental health of Black students caused by normalization of hate crimes at universities. 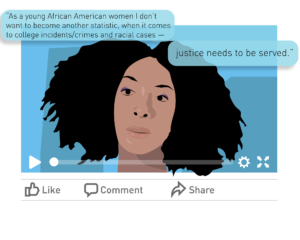 “As a young African American woman I don’t want to become another statistic, when it comes to college incidents/crimes and racial cases — justice needs to be served,” Rowe said in a Facebook Live video. Crimes and incidents that negatively affect the mental health of Black students should be handled with direct intervention by the administration. The top priority for universities should be the well-being of their students and addressing racism on their campuses. University promises to take a stand against racism, hate and bullying are empty — unless also accompanied by action. Administrators need to invest in resources to prevent hate crimes and support students of color beyond just filing police reports. Universities must stop normalizing hate crimes against Black students. Administrations must be clear that perpetrators of violence are not welcome on campuses. At UC Santa Cruz, 151 hate and bias incidents were reported in the 2016-17 school year alone. The Office of Diversity, Equity, and Inclusion (ODEI) was informed of white supremacy flyers found around campus on Oct. 6, the same flyers that had been found the year before. Hateful speech has flown under the radar of UCSC administration because it is protected by the First Amendment. The only action taken by universities on hate incidents is when physical violence occurs. This policy fails to recognize that the violence of hate speech is equally damaging. Contrarily, Blumenthal’s message on the ODEI website states the university is dedicated to creating an environment where students feel safe, heard and can foster a sense of belonging. Administrators’ lack of recognition to the damaging effects of hate speech on the mental health of Black students is contradictory to statements regarding inclusivity and diversity. Black student representation at UCSC has never been above 4 percent since its founding. The university prides itself on diversity, yet has made no investment in raising that percentage. The allowance of hate speech does not create brave spaces on campuses because it excludes Black students and students of color from feeling mentally and physically safe. The kind of violence that targeted Rowe undoubtedly has happened on this campus in addition to the documented white supremacy fliers. To take real action on inclusivity, universities including UCSC must implement programs that eliminate daily discrimination and reprimand students who commit injustice.